This is something I have to admit to buying for some reason I will never quit understand as I would have been at St Andrews University at the time. 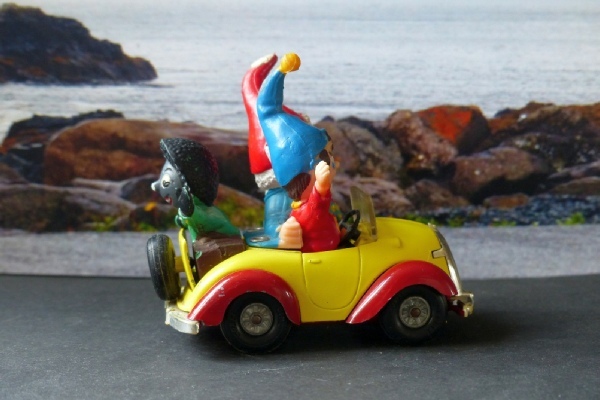 Dougal and The Magic Roundabout were also extremely popular at the time and, although I never did get any of the Magic Roundabout models I did have a fluffy Dougal and the Corgi Noddy car #801 with Big Ears and Golly. I think it was Golly - whoever it was disappeared in Scotland and my memory fails me now. I have since fitted a grey faced Golly in the boot. There were three main variants: black faced Golly, grey faced Golly and a Brown Bear. I am trying to get hold of a black faced Golly version. I have also noticed a difference in the wheels and the photos show two models for comparison. One has quite plain wheels whilst the normal ones are the decorated type. I need to find out more before selling the plain wheel version but the brighter yellow model is the one for sale here at the moment. It is missing one light but generally in very good and clean condition. I will sell the plain wheel one too in due course or you can make an offer separately.